If you've played the game Shogun: Total War, then you'll find a lot familiar with Medieval: Total War. Not that that's necessarily a bad thing - with Medieval: Total War you'll get the same strategic and tactical component, including the massive real-time battles for which the first game was known. Medieval: Total War is not an expansion game, though; it is a complete game and stands on its own. As you can probably guess from its name, Medieval: Total War moves the action from feudal Japan to feudal Europe. You'll have your choice of one of several single player modes of play: Quick Battle, Custom Battle, Campaign, Historical Battle, and Historical Campaigns. Quick Battle is the easiest way to jump right into a real-time battle. The game will pick the sides and the starting forces, all you need to do is take command. 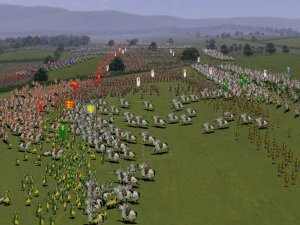 Custom Battle allows you to specify a 'budget' for each side with which you purchase units for your army (units in the game are not individual soldiers, but formations made up of up to 100 men). Once you've selected the armies for the combatants and a field of battle, you can set the starting position of each of your units and then charge into battle. The Historical Battle mode is similar to the other battle modes, except that the starting units and their positions are fixed, based on the battle being reenacted. The game does not come with many historical battles, but additional battles can be downloaded from the Internet. There are also additional battles in the Historical Campaign mode, but the name "Campaign" is a bit of a misnomer. Winning a battle unlocks the next one in the sequence, while losing means that you'll have to fight it over again. It is not so much a campaign as a set of additional battles. In any of the modes, the battle takes place on a 3D map with rolling hills, groves of trees, roads, farms, and pretty much everything you'd expect to see in a medieval landscape. The degree of topology depends on the area in which the battle is fought, so coastal lowlands might be nearly flat, while battles fought in the foothills of the Alps will feature some pretty steep hills. The terrain on which you fight has an effect on combat, as it is a lot easier to fire arrow barrages or lead a charge down a hill than up it. Trees also play a role, hiding units from sight and giving an advantage to foot troops over their mounted counterparts. You can swing, rotate, and zoom the camera in full 3D, but the zoom level is limited. It is impossible to pull the camera far back in order to get a good wide angle view of the field of battle. This can become an annoyance in large-scale battles, as you'll have to scroll across the battle field to get from one flank to another, or spend a lot of time clicking the mini-map. The camera movement also runs slightly slowly, even on high-end systems, making control of the camera part of your battlefield struggle at times. You select units by selecting the banner carried by their troops. Units can also be collected into groups to make it easier to give orders to carry out large-scale maneuvers or attacks. You can give troops a few basic formation orders (close ranks, open ranks, and wedge) that can be further customized by a simple drag and click command. While you have a unit selected, you can click at a point on the map and begin dragging the mouse. As you drag the mouse, you can specify the form that you want your unit to take when it reaches its destination - the longer you drag the mouse, the longer and more shallow your lines will be. In addition to the formation and movement orders, units can be commanded to hold their position or engage at will.